Only in a long-term perspective does the profound difference between pre-industrial and industrial society-nature relations become clearly visible. 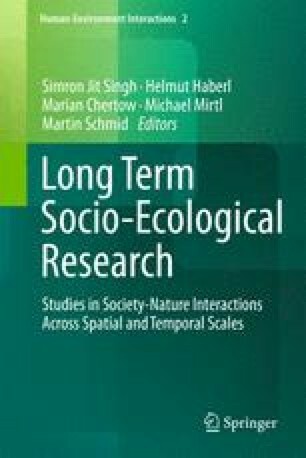 Long-term socio-ecological research (LTSER) extends its temporal scope significantly with contributions from environmental history. This chapter discusses the Danube, Europe’s second longest, and the world’s most international river, as a long-term case study. We approach the river as a ‘socio-natural site‘, i.e. the nexus of arrangements (such as harbours, bridges, power plants or dams) with practices (such as river regulation, transportation, food- and energy-procuring). Arrangements and practices are both understood as socio-natural hybrids. We discuss how and why practices and arrangements developed over time and which legacies past practices and arrangements had. We emphasise the role of usable energy (so-called exergy) in the transformation of socio-natural sites. Since industrialisation, the amount of exergy harvestable from the Danube’s arrangements has increased by orders of magnitude and so have the societal and ecological risks from controlling these exergy-dense arrangements. The arrangements we have inherited from our ancestors determine the scope of options we have in the present when dealing with rivers like the Danube. Current management decisions should therefore be based on the firm ground of historical knowledge. The research presented in this chapter was funded by the Austrian Science Fund (FWF) within the project ‘Environmental History of the Viennese Danube 1500–1890 (ENVIEDAN)’ (P22265 G-18). The historical reconstructions of the riverine landscape in the Machland result from the FWF-funded project ‘Reconstruction of Danube Habitats in the Austrian Machland 1715–1991’ (P14959-B06) at the Institute of Hydrobiology and Aquatic Ecosystem Management, University of Natural Resources and Life Sciences Vienna (BOKU).